The Utah Effect • Among equally poor populations in SLC, data show east side-west side split along ethnic lines. The racial and ethnic split in Salt Lake City transcends the pay scale. A look at poverty data shows that poor white people predominantly live on the east side of Interstate 15 and equally poor minorities mostly live on the west side. That&apos;s just one interesting fact from a map of poverty in Salt Lake County. "I think part of that is self-selection, particularly of minorities," said James Wood, director of the Bureau of Economic and Business Research at the University of Utah. "It is an interesting spacial distribution." The capital city&apos;s population is 16.6 percent poor, according to 2010 data released by the federal Department of Housing and Urban Development. It defines poor as living at the federal poverty level. People who live in and around Salt Lake City know that the east side is more affluent, but its poverty rate isn&apos;t far off the west side&apos;s. The racial divide, though, is huge. East side: 16.2 percent of residents are poor, and 32.5 percent of those poor people are minorities. West side: 17.1 percent are poor and 68.8 percent of the poor are minorities. The city&apos;s east side is an anomaly when compared with the rest of the county, where the connection between high poverty rates and minority populations is strong. And that&apos;s where the available housing comes into play. The big growth areas in the county, places such as South Jordan and Herriman, are also the cities with the lowest poverty rates. The simple reason is because contractors are not building low-income housing and the cities are not requiring it. The cities with higher-than-average poverty rates are those that have lots of rental units and big minority populations, Wood said. 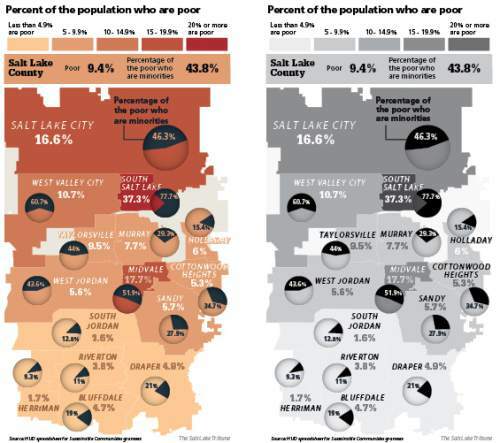 South Salt Lake has the county&apos;s highest percentage of residents who are poor (37.3 percent) and the highest percentage of poor people who are minorities (77.7 percent). Next up is Midvale, with its large Latino population, followed by Salt Lake City. West Valley City is the only other city with a poverty rate in the double digits and 60 percent of those poor people are minorities. Salt Lake City seems to be a magnet for poor whites. The county has 51,000 poor white people, 15,600 of whom live in Salt Lake City, 12,200 of them on the east side. "If you look up in the Avenues area, you&apos;ll find people on food stamps," said Karen Crompton, associate director of human services for Salt Lake County. "It&apos;s not as visible, which I guess is the good news. The bad news is these people become sort of invisible." Crompton says poor people tend to cluster not only where they can afford to live, but where there are jobs and services. That would be in the Salt Lake City area, which explains why the cities nearest the capital also tend to have higher poverty rates. Salt Lake City Mayor Ralph Becker has argued that a livable city includes "affordable housing" and he wants more of it. To be precise, he&apos;s calling for adding 5,000 units of affordable housing in the next five years. On which side of the interstate those units are built may play a factor in the people who live there. 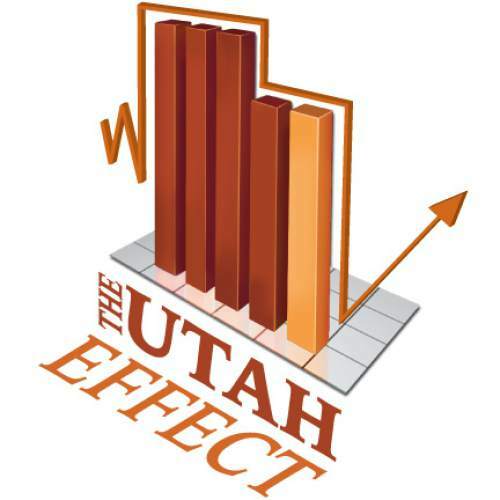 The Utah Effect, a blog by Tribune reporters, looks at statistics that explain the Beehive state. Find past entries here.